Over 10 years grooming experience at your door!! Servicing a neighborhood near you! Business is Booming! Routes are filling up quickly... getting more difficult to accommodate last minute grooming requests! clients need to be on a pre-booked grooming schedule. Chatty K-9 cannot guarantee you an appointment on a "call as you need" basis. We call, email or text you 48 hours in advance to remind you of your appointment and to insure we have access to your home and your dog and all other pertinent information. We estimate a morning or afternoon arrival time. 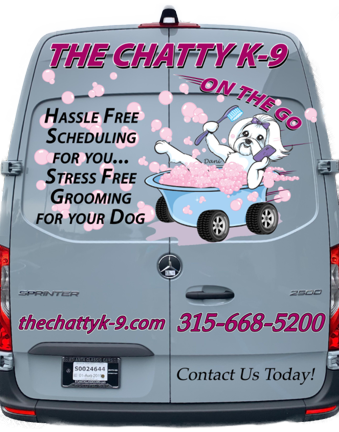 We pull up to your curb or park in your driveway and grab your dog(s) and bring them to the grooming van. We lock ourselves in and begin the grooming process. When finished, they are returned to the area we obtained them from and a receipt is left in the designated spot. And we are off to our next appointment. Voila!!!!! Hassle free for you, stress free for your dog. There are few ways you can contact us!